AT&T plans to launch 5G Evolution in parts of Minneapolis in the coming months. It will provide its latest network technology in some parts of the city, including areas near the host stadium, in time for the Big Game in February. Minneapolis is one of 20 markets where we plan to bring AT&T 5G Evolution by the end of the year, with this technology already available in parts of Austin and Indianapolis today. 5G Evolution offers customers a taste of the future of entertainment and connectivity on their devices. In 5G Evolution markets, we upgrade cell towers with network upgrades that include ultra-fast LTE Advanced features like 256 QAM, 4×4 MIMO, and 3-way carrier aggregation. These features, together with other upgrades, are providing faster speeds and a better customer experience. With the LG V30, Moto Z2 Force Edition, Samsung Galaxy Note8, Samsung Galaxy S8, Samsung Galaxy S8+, and the Samsung Galaxy S8 Active, AT&T wireless customers in 5G Evolution markets can use these 3 technologies simultaneously. This makes it possible to take full advantage of the wireless experience. We’ll have more 5G Evolution capable devices in the coming months. We’re aggressively deploying equipment and investing in the right mix of spectrum and technology while 5G standards are still being finalized. We’re working with more than a dozen global technology companies to deploy 5G. And we’re are an industry leader finalizing 3rd Generation Partnership Project (3GPP) wireless standards requirements by the end of the year. These standards will enable chipset development for global 5G. This is a major step on our journey to deliver standards based 5G mobile networks as soon as late 2018. 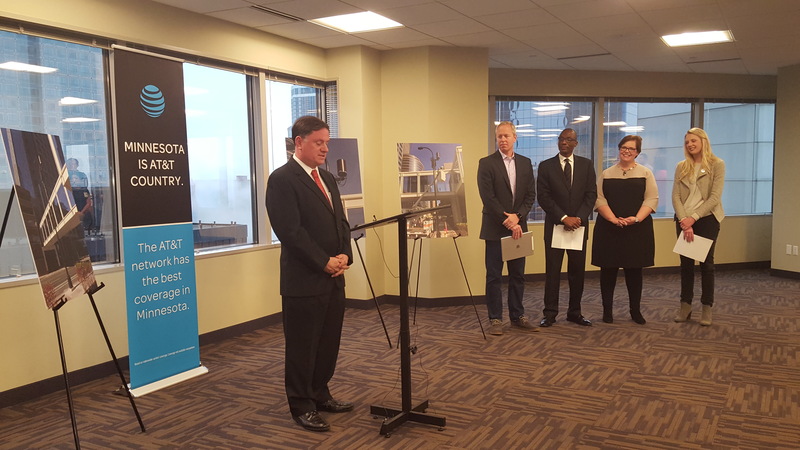 We’ve been working closely with the city of Minneapolis to ensure its network is ready to support the technology of the future. The investments we’re making prepare us for the future of 5G and innovations like smarter cities and immersive entertainment experiences over augmented and virtual reality. Adding these LTE Advanced technologies to the wireless network in Minneapolis is just one of the ways we’re investing to improve the customer experience in the area. From 2014-2016, we invested nearly $350 million in our Minnesota wireless and wired networks. These investments drive a wide range of upgrades to reliability, coverage, speed and overall performance for Minnesota consumers and businesses. They also enhance critical services that support public safety and first responders. In 2016, we made 1,271 wireless network upgrades in 272 communities across Minnesota. This includes adding new cell sites and network capacity to existing cell sites. Continuing to expand our network in the area gives AT&T the most wireless coverage in Minnesota. Besides upgrading the network in and around downtown Minneapolis, we’re also making significant upgrades to Distributed Antenna System (DAS) at the Big Game host stadium in downtown Minneapolis. The DAS at the stadium is future-ready. That means we’ve overloaded the stadium with wireless capacity and boosted LTE capacity by more than 150% compared to last year. With more than 800 antennas, the network inside the stadium alone could provide coverage to the entire city of Minneapolis. Small cells are also an important ingredient on our path to 5G. We’ve already installed a number of small cells in Minneapolis and plan to add more in the next few months. The payoff of our 5G network will be limitless for our customers. Lab trials are already reaching speeds up to 14 gigabits-per-second with fixed wireless 5G technologies. We’ll continue advancing 5G in our AT&T Labs locations and in field trials. And we plan to delve further into the role of software-defined networks and 5G. AT&T Inc. (NYSE:T) helps millions around the globe connect with leading entertainment, business, mobile and high speed internet services. We offer the nation’s best data network and the best global coverage of any U.S. wireless provider. ** We’re one of the world’s largest providers of pay TV. We have TV customers in the U.S. and 11 Latin American countries. Nearly 3.5 million companies, from small to large businesses around the globe, turn to AT&T for our highly secure smart solutions.